A vehicle that was originally built for World War II as a lightweight off-road vehicle, the Jeep is a four-wheel drive utility vehicle. It is known as "jeep" because it was originally called "G.P." for "General Purpose" or "Government Purpose," and the acronym eventually slurred into the phoneme "jeep." Because the Jeep was lightweight and versatile, it became very popular, and after WWII, was sold on the civilian market. Jeep is currently a division of Chrysler Group LLC. Prior to U.S. involvement in WWII, which did not begin until after the Japanese attack on Pearl Harbor in 1941, the U.S. participated in a number of programs that supported the Allied powers, including Britain, France, and the Soviet Union, against the Axis powers, including Germany, Japan, and Italy. One of these assistance-based programs was the lend-lease program, where the United States would provide the Allied forces with tanks, airplanes, vehicles, ammunition, food, and other materials to the Allied powers on a temporary lend basis or in return for leases on European bases. 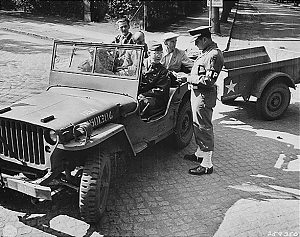 The Jeep was one of such vehicles used in the lend-lease program. "The WWII jeep with M-100 trailer, Potsdam, Germany, July 14, 1945".